Bracelet fashion seems to shift strangely every five or so years. From friendship bracelets, to snap bracelets, then gel wristbands, and the variously shaped Silly Bandz, we’ve seen fads pop up only to fade within the year, leaving behind a faint trail of glitter and nostalgia. Don’t be misled by the fact that only one has “silly” in the name – these are all pretty goofy (no offense to anyone’s 13-year-old self, or any current 13-year-olds). So it’s nice to see that the latest form of wrist adornment is not just practical, but has potential life-saving uses. Survivalists have utilized Paracord bracelets for years, but they have recently started to catch on elsewhere and go mainstream. As you may have guessed, the name refers to its original use in parachute suspension lines. That alone should tell you something about its popularity with survivalists. If you’re going to jump out of a plane thousands of feet above the ground, you want every part of your chute to perform exceptionally! For those staying on the ground, the bracelet form of Paracord is popular because it allows the wearer to carry between eight and 10 feet of cord, without having to do anything more than clip on a bracelet. What could be more convenient? You could wear one camping or hiking, and practically forget it was there. But if you got into a situation when you needed it, you’d be glad you remembered! Knowing all the various ways Paracord can be used starts with understanding the construction of Paracord. An exterior nylon sheath covers additional yarns, usually seven to nine, which in turn are composed of even smaller threads. Paracord is lightweight but incredibly sturdy, and you can use even the smallest threads for different purposes. Spare rope: If you’re camping and a tent tie breaks, or a shoelace snaps, or you lose the rope that was keeping your sleeping bag tied shut, you could easily use Paracord as a substitute. These aren’t life/death uses, but a broken shoe lace at the start of a week-long hike could certainly be a trip-spoiler. Most Paracord bracelets hold between seven and 10 feet of cord, (not counting the smaller inner sections), and, depending on how it is unwound, can hold from 90 to 550 pounds. Note: Paracord is not intended to be used as a climbing rope. Splint/Sling: If you break a bone in the great outdoors and can’t get immediate medical treatment, setting the bone with a makeshift splint is critical. This will help the injury heal properly and reduce the risk of further damage. In most cases, hard items like tree branches or bark are readily available, and you can use the Paracord to tie them alongside the broken bone to form a splint. If your arm is broken, you can use Paracord tied in a loop and hung around your neck and shoulder as a sling. Tourniquet: It isn’t ideal (no situation involving your potential death from blood loss is), but in an emergency Paracord from a bracelet can be used as a tourniquet. Tie a section of Paracord above the wound and slip a stick or other hard object between the skin and cord. Then rotate the stick to tighten the cord and slow the bleeding. NOTE: Don’t overtighten the cord, and be mindful of how long the tourniquet is left on. You could accidentally cause tissue damage, especially since Paracord is thin and will put a lot of pressure on the tissue. Typically, tourniquets are wider than Paracord to better distribute the pressure. Still, using the cord is better than you or a companion bleeding out. Starting a fire: Starting a fire with a Paracord is best accomplished using the bow drill method. Essentially, you’ll need a curved stick, thick enough that it doesn’t bend or snap easily and approximately forearm length. The “bow” is made by attaching a length of Paracord to the stick, securing it at either end. There should be plenty of slack in the cord; it does not need to be taut. Make a loop in the center of the cord. Insert a short stick, sharpened on one side, through the loop. Pull the bow so the Paracord is tight around the stick. The pointed end should be facing down, and placed on top of a flat piece of wood, with tinder nearby. Holding the stick steady, make rapid, steady sawing motions with the bow. This will cause the stick to rotate rapidly. Eventually, the friction will cause a spark and you can start a fire. Fishing line: The smallest interior strings of Paracord can be removed and used for fishing line (you’ll need a hook). Dental floss: Okay, you’ll probably never need dental floss this badly, but come on, neglecting dental hygiene is just gross. Use the smallest inner strands of the Paracord for this. Rafting: Use the strings to tie logs or branches together into a raft. And these are just a few of the uses! A quick search on YouTube reveals thousands of videos from survivalists and wilderness enthusiasts who seem to specialize in finding inventive uses for Paracord. 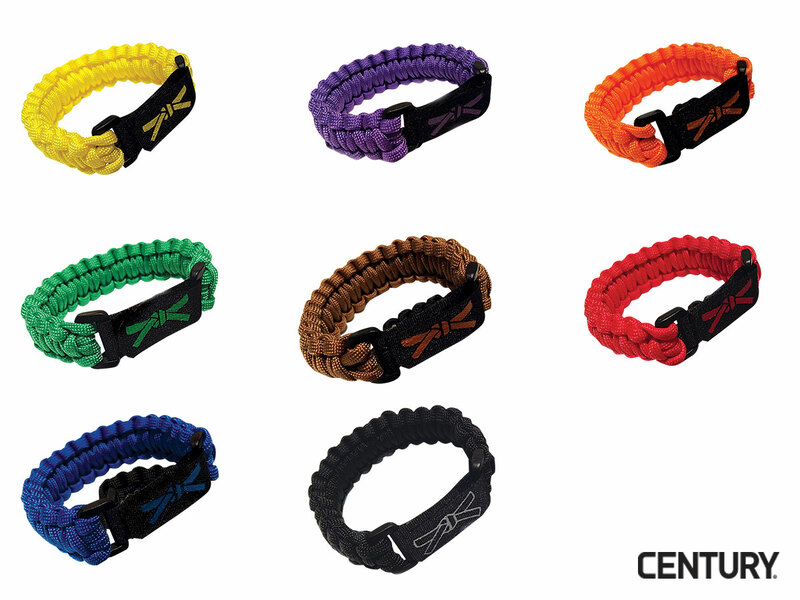 Check out a few before your next outdoors expedition – and don’t forget a Paracord bracelet from Century! Have you ever used Paracord for survival or practical purposes? Been in a situation where some would have come in handy? Let us know in the comments!